When I last blogged on Fred Ray’s new book, I covered Chapters 1 to 3. The author went into the background of light troops, their uses, tactics, and formations, both in Europe and then in America. The French military dominated tactical thinking in the 1850’s, and American military minds were willing pupils of the French as the Civil War started. Ray next tackles the state of the Union and Confederate forces at the beginning of the Civil War. He notes that the small standing army left both sides completely unprepared for what they were about to face. In addition, early in the war most troops on both sides were armed with smoothbore weapons, and the Confederate Army of Northern Virginia did not even see a majority of its men using rifles until after the Battle of Chancellorsville. Ray also notes that the two tactical practices predicted for rifle toting infantrymen, long range firefights and bayonet charges, did not happen very frequently. Even though rifles started to replace muskets, the slow rate of fire meant that men still needed to be massed in large, packed formations to deliver maximum firepower. These formations maintained an emphasis on the unit as a machine. Skirmishing, on the other hand, focused on individuality. At first, soldiers were drawn fro, units with no regard to affiliation or skill. This led to lack of familiarity and also led to mediocre soldiers performing this important duty. Later, soldiers in flank companies were given rifles and asked to perform picket duty on a routine basis. Ray writes that Confederate soldiers seemed to have an advantage on average as far as skill with a gun went. Many Northern soldiers had never even fired a gun when they first joined the army. Some Union soldiers were skilled at the art of target shooting, and these were gathered together in units such as Berdan’s United States Sharpshooter Regiments. Richard Ewell was the first on the Confederate side to attempt to organize his skirmishers in an orderly fashion. He ordered each brigade of his division to take two companies of each regiment and form a battalion that would be trained in the duties of light infantry. These orders couldn’t be implemented because the division was soon engaged in the Valley Campaign, leaving no time to train the troops correctly. The reorganization of the Confederate regiments in April 1862 also led to the formation of some “sharpshooter” units, such as the Palmetto Sharpshooters. They had been tabbed to become a unit trained specifically as sharpshooters, but Confederate manpower needs forced them to continue as a regular infantry regiment. During the Yorktown phase of McClellan’s Peninsula Campaign, troops in Wilcox’s Alabama brigade were brought together under Archibald Gracie and formed an ad hoc light infantry battalion for a month. It soon disbanded, but it had helped Magruder protect his Yorktown line. The Confederates also ran into Berdan’s Federal sharpshooter units around this time. In response, they formed a corps of sharpshooters from several rifle-carrying companies of various regiments. In May 1862 the Confederate government officially authorized a sharpshooter battalion for each brigade in the army to be composed of between 3 and 6 companies from the brigade. In addition, many “sharpshooter” units held that title while actually serving only as line infantry, similar to the situation of the Palmetto Sharpshooters above. However, the constant fighting and movement of 1862 prevented these ideas from taking shape just yet. 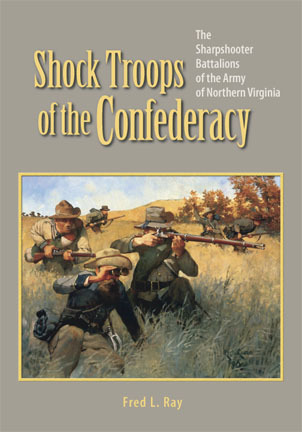 Ray concludes the chapter by mentioning that the sharpshooter ideas seemed to come from men who had served together in 1861. Ewell commanded a brigade in Van Dorn’s Division, and Ewell’s subordinates included Robert Rodes, Eugene Blackford, and Bristor Gayle, with Rodes getting the lion’s share of credit for eventually putting the sharpshooter battalion theories into practice. Robert Rodes was Colonel of the 5th Alabama early in the war, and it was a part of Ewell’s Brigade. Rodes was known as a strict disciplinarian and he was essentially the drillmaster for the brigade. When Ewell was promoted to division command, Rodes took over the brigade in October 1861. Look for my next entry a week from today. I plan to continue posting these little blurbs each Monday until I’ve finished the book. A review will be forthcoming shortly after that point.